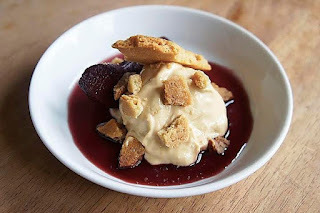 The Potlatch, a new pop-up from chef Nick Gilkinson, is holding its first dinner at The Canvas Cafe in Hanbury Street, off Brick Lane, on Tuesday 8th March 2016. Dishes are likely to include Duck Liver Parfait, Rhubarb and Brioche alongside Pork Cracklings seasoned with Anchovy and Sunflower Seed, and tickets cost just £65 - please help support the first of what we hope will be a regular series. "Introducing London’s newest pop-up restaurant, which launches with an East London takeover at The Canvas Cafe, a creative social enterprise venue just off Brick Lane on Tuesday 8th March 2016 - helping showcase Nick Gilkinson’s vision and style of hospitality by collaborating with some of London’s freshest kitchen talents once a month with an all-inclusive food and drink menu at £60 per head. After quitting his job in finance back in January 2014, Gilkinson embarked on a journey to pursue his dream of running his own restaurant one day. Gilkinson has spent the last 2 years working with D&D London, spending time in a number of their sites and is currently part of the management team that has opened The German Gymnasium in King’s Cross. With a set menu devised by former Clove Club chef, Jonathan Williams, the passionate Canadian will be taking control in the kitchen and providing guests with a feast of sensational new British-inspired dishes. Expect to start off with Duck Liver Parfait, Rhubarb and Brioche alongside Pork Cracklings seasoned with Anchovy and Sunflower Seed whilst enjoying a welcome cocktail designed by Gilkinson himself.